"The Final Fate of Earth 2" - Part Five: "Weaponized"
As Power Girl, Hawkgirl, Fury, Red Tornado, the Flash and Superman battle the Green Lantern while trying to break the Ultra-Humanite's control of him, Huntress, Boy Wonder and Batman infiltrate the villain's Central Control. Things do not go well for the heroic Wonders in Metropolis. Alan Scott has outmaneuvered them in every way. It isn't until Green Lantern nearly crushes Power Girl to death that the Ultra-Humanite's brainwashing is undone. Batman's group had distracted him, breaking his concentration. Green Lantern kills the Ultra-Humanite. Victory has come to Earth 2's superheroes, but there is a price. Batman is dead. His neck was broken by the Ultra-Humanite. How will Huntress, Boy Wonder and the rest of the Wonders of the newly restarted Earth 2 continue without their comrade, friend and father? Story - 5: Since Dan Abnett has been writing for this title, it's been my favorite DC title. Granted, I haven't had a chance to catch up on some of the comics I normally read due to writing deadlines on various projects. 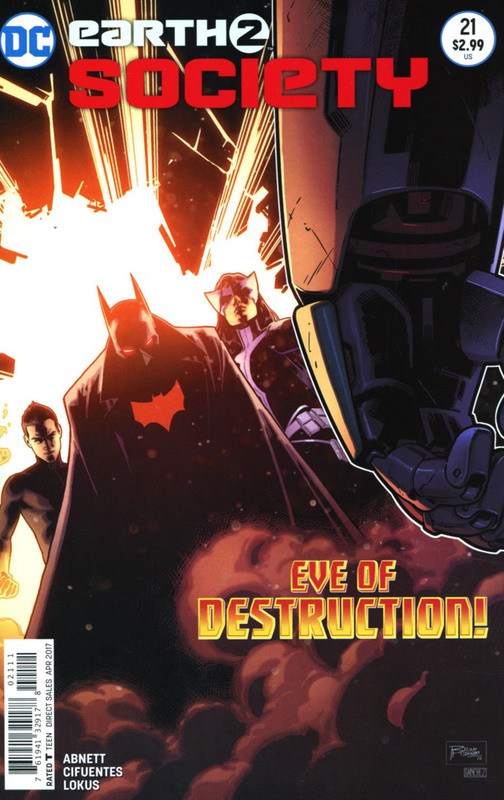 Yet, I've enjoyed every issue of this comic under Abnett, and this chapter has been a fast, fun thrill ride. I am sincerely impatient to see how this serial continues. Art - 4: The art is great, but I knocked a point off for poorly drawn S shields. Cover Art - 5: This is yet another incredible cover for this incredible series. In general, the images used for every issue has made me want to buy the books.